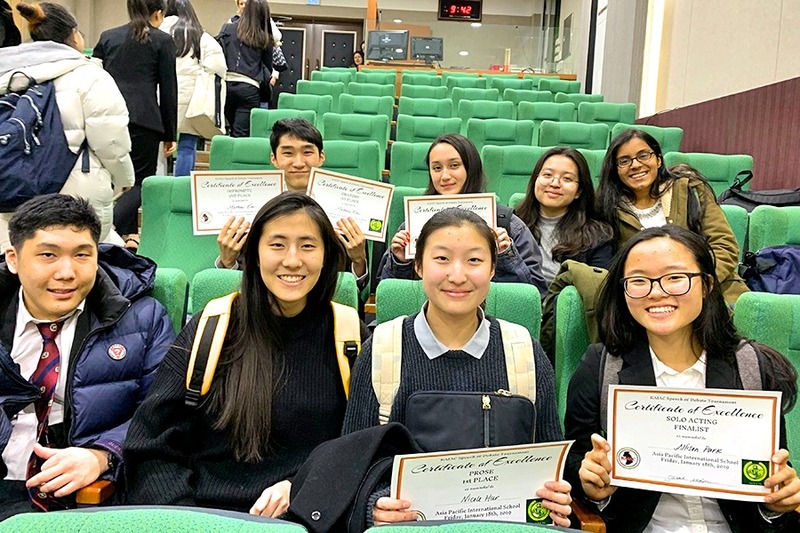 The YISS Forensics team participated in their third tournament of the year at Asia Pacific International School (APIS) on January 18 and 19. Several students stood out for their accomplishments in speech events. Nicole H. (9) won first place for her dramatic reading of "Thirteen" in the prose category. Matthew K. (11) placed in two events: first place in oratory and second place in impromptu. Allison P. (12) made it to the finals in solo acting with a hilarious rendition of "Bible Camp: the Musical," and Mia C. (11) placed third in poetry for her reading of "Waking Up Naked" and "Nearest Exit." YISS took three debate teams to the APIS tournament but unfortunately did not secure a space in the finals. The YISS Forensics team was very close to placing second in the tournament overall but still ended up in a respectable third place. Well done to all participants!